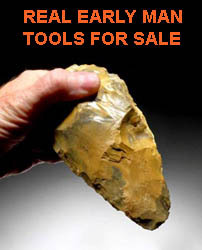 Stone tools are the oldest traces of human activity. The theories of the origin of humans vary widely and have been at the center of heated debates for hundreds of years. Despite our modern technology and advances in the sciences, concrete evidence is still lacking to prove any of these theories. Creationists believe that man was simply created in a modern form and did not evolve from more primitive creatures. Those subscribing to the belief in evolution believe that man's beginning is founded in early mammalian evolution. Certain lizards evolved into mammals, those mammals gave rise to apes and monkeys and finally, man emerged from these primates through a progression of species leading to modern man, Homo sapiens. Finally, some subscribe to a hybrid theory as a combination of these two - man was created as "man" and went through a series of developmental changes. Theories aside, we all cannot argue the existence of prehistoric humans as we DO have concrete evidence from the presence of campsites, tools and artifacts that date back as far as over two million years and have been found throughout the world. Scientific record and evidence places the beginning of the genus HOMO at two million years ago with the emergence of Homo habilis from East and Southern Africa. This species is the earliest known record of man that is categorized in the same group as living humans. It was at this point in time that stone tools first appeared and they are classified as the OLDOWAN / DEVELOPED OLDOWAN Tradition. Homo habilis represents a remarkable change in the comparison of other earlier species believed to be more primitive forms of humans. Up to this point in time, Africa is the only location in the world for human existence. At 1.75 million years ago, Homo erectus (a.k.a. Homo ergaster) appears and spreads throughout North Africa eventually traveling to Eurasia. Homo erectus (other H. erectus variants include Homo ergaster, Homo heidelbergensis) survived for 1.5 million years in Africa and Asia. They were active hunters that lived in small huts and caves, mastered the use of fire and fashioned a variety of stone tools. These bifacial stone tools were different from the Oldowan tools as they were fashioned out of large flakes and occur in greater abundance and variety. This change in tool development first occurs 1.4 million years ago and is classified as the ACHEULIAN TRADITION. From 500,000 years ago to 250,000 years ago, Homo erectus was transitioning into an archaic form of Homo sapiens in Africa and Europe. 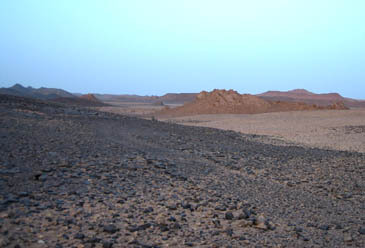 True Homo erectus simultaneously existed at this time only in Northern Africa and China but eventually disappears from the fossil record 250,000 years ago leaving Homo sapiens as the only human species left on the planet. The most famous variety of archaic Homo sapiens is undoubtedly the Neanderthal people. Perhaps no other type of primitive man has been so maligned as that of the Neanderthals and recent discoveries are sending many scientists back to their proverbial drawing boards to rewrite an accurate account of these amazing peoples. Scientists now classify them as a sub-species of Homo sapiens, Homo sapiens neanderthalensis. With the emergence of Neanderthals comes a new, more advanced and specialized tool technology called the MOUSTERIAN TRADITION. While signs of developing Neanderthals arose 300,000 years ago, true Neanderthals can first be attributed back to 150,000 years ago. They populated regions in Europe and the Near East, and existed right up to just 30,000 years ago in western France. Between 125,000 and 100,000 years ago, the Neanderthals spread east and south, and they are known in northern Africa and from France through southern Europe, the former southern Soviet states and Iraq. Current evidence shows that despite Neanderthals' stockier build, they share several key features with modern man. There is also clear evidence that they had control of fire, lived in caves or open-air structures of stone and vegetation. The final era of the Late Stone Age was ushered in by significant milestones of human development. This period is most typically called the Upper Paleolithic Period and begins at 40,000 years ago until 10,000 years ago when the Paleolithic Period, as well as the Pleistocene Period, came to a close. Exciting, significant changes were taking place all across humanity of the planet. The Upper Paleolithic is most famous for the FIRST occurrence of modern humans, Homo sapiens, in the form that we are today. The fossil record shows that they lived for a period, alongside Neanderthals, until Neanderthals died out or were genetically assimilated into the Cro-Magnon (modern human) populations. This period is the first time in archaeology where humans exhibit a creative mind and one that displays self worth. Famous to this period are the many magnificent caves filled with art showing incredible imagery of animals, hunting groups and story-telling. We see the first evidence of body adornment and religion by the carving in stone, bone and ivory of mother goddess figures. Many famous sites of this period show ritual care of the dead never seen before. Numerous skeletons have been found covered in ochre and wearing jewelry, indicating increased evidence of human belief in an afterlife. The most notable milestone in tool production of the Upper Paleolithic Period is the extensive use of the BLADE TECHNIQUE. Blades of long, narrow flakes with parallel sides are found struck from prepared cores and then modified into a variety of specialized tools. Many of the flaked blades are modified into other tools with an increasing refinement of all flaked tools such as wafer-thin projectile points and very small prismatic blades, possibly used as replaceable inserts in larger composite tools. We also see the first use of bone and ivory for use in new inventions such as fish hooks and harpoons indicating the first evidence of fishing. Probably the monumental invention of this period is that of the atlatl (spear-thrower) which revolutionized hunting of large game. This final period of the Old Stone Age marks the final retreat of the ice from Europe and with it, a warming period that gave rise to large populations of megafauna to support an increasing population of advanced hunters. By these advanced hunter we also see the first evidence of communal cooperation by the images of hunting parties as seen in many cave paintings of this period. Another interesting concept we see boldly emerge in the human mind is the concept of something with value. This is demonstrated in many of the fantastic knapped and carved artifacts, done so in excess of what would be needed for their purely utilitarian purpose. The level of craftsmanship in flaked tools of this period rose to level never before found in previous older periods. The cause of the Upper Paleolithic explosion of human creativity and invention is still somewhat of a mystery and there are many theories why it came about. Some attribute it to an "arms race" of sorts where human groups were vying for intense competition amongst each other in their survival. Others theorize that increasing human populations allowed increased interaction of concepts and ideas among people that were previously isolated by their scarcer numbers. A vast amount of information can be gained from the study of Paleolithic tools. The examination of their potential uses as well as changing designs provides not only a wealth of information as to the daily life of primitive man but also exhibits the advancement and development of the human species as a whole.